Two field biologists visited the country’s last ecological frontier to conduct surveys on Palawan’s flora and fauna last November and December 2011. Dr. Arvin Diesmos, curator of the Zoology Department at the Philippine National Museum, is an expert in herpetology—the study of reptiles and amphibians. He stayed in El Nido from November 3 to 8, searching for frogs, toads, lizards and snakes in the islands of Lagen, Miniloc and Dibuluan, and in Brgy. Villa Libertad in mainland Palawan. His most interesting find is the worm skink from the genus Brachymeles. 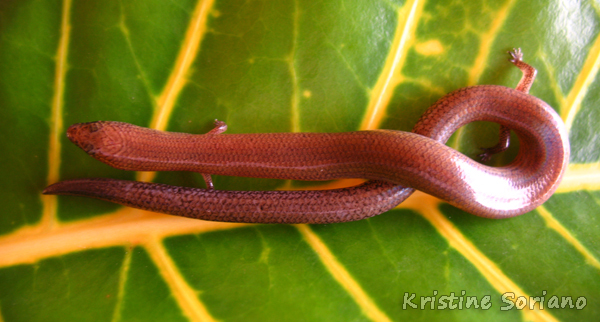 This skink had very minute limbs, making it look like a worm and moving in a fashion similar to snakes. Mr. Ulysses Ferreras, a well-known field botanist, paid El Nido a second visit three years after his first survey in 2008. He conducted habitat assessments and plant identification in Lagen, Miniloc, Pangulasian, Dibuluan, and Snake Islands. He found many plants endemic to Palawan – plants that can only be found in Palawan and nowhere else in the world – such as Palawan mangkono (Xanthostemon speciosus), Palawan santan (Ixora palawanensis) and pitcher plant (Nepenthes philippinensis). Both scientists gave presentations to the guests and staff showcasing Palawan’s unique and beautiful biodiversity in terms of reptiles, amphibians, and plants. They also conducted trainings for the staff on reptile, amphibian, and plant identification and gave them more reasons to be proud and protective of their environment.